Straightening your smile doesn’t have to include embarrassing hardware. At Merion Village Dental, we know that misaligned teeth are about more than what meets the eye – it’s an issue that can cause complications with speech, neck pain, self-confidence, and even digestive issues. 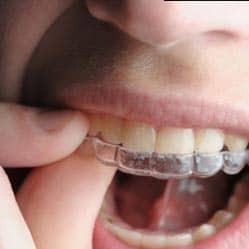 Traditional treatments included embarrassing and cumbersome hardware to straighten teeth, cause patients to endure years of inconvenience before seeing results. At Merion Village Dental, we deliver straightening options that are barely noticeable. If you have misaligned teeth, you don’t have to settle for metal brackets and wires as your only treatment option. Our dentists will create a straightening plan for your smile, setting you on a wire-free path to a healthier and more confident smile. Barely noticeable straightening solutions mean that your smile can get back on track without drawing attention to embarrassing metal appliances. Let us get your smile back on track. Have you been hiding your smile due to crooked teeth? Call our office today to set up your appointment for a straight and beautiful smile!